Established in the 17th century, the district of Nyhavn in the beautiful city of Copenhagen features a canal, brightly coloured buildings, and is a popular entertainment district from dusk to dawn. 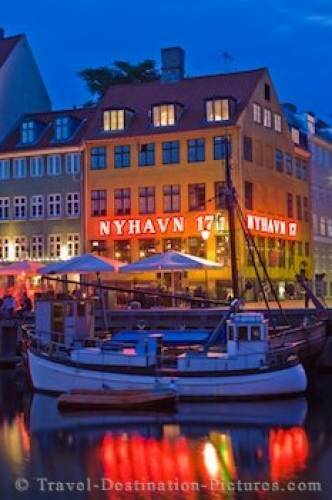 Definitely one of the busiest places to go out at night in Copenhagen is the Nyhavn district with countless bars and restaurants along the Nyhavn waterway with its row of anchored boats and colourful buildings. At dusk the buildings which line the canal are lit up as the entertainment available along the waterfront gets into full swing. district of Nyhavn, Copenhagen, Denmark.